I want perfection and safety as much as the next person. I would like every plant to live, my family members to be healthy and a overt liberal to be appointed to replace Stevens on the Supreme Court. OK, these might not be your definition of perfection or what you’d protect, but I’m sure that you all could come up with another wish list. The notion of keeping things safe jumped out in front of me on the way to a consultation today. I drove past a house on the water, and saw a group of tattered mummies on parade. They were Juniperus virginiana, as far as I could tell, that had been upholstered for the winter. Landscaping an oceanfront property is challenging, no doubt about it, and the number of plants that will survive such exposure is limited. It’s understandable that people would want to protect their landscaping if they can, but what is the cost of the illusion of safety? Where else are we willing to live with the tattered and ugly in exchange for the impression of wellbeing? 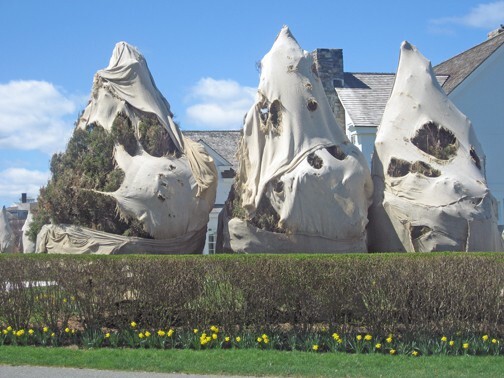 Are they Stonehenge Muppets, or an installation by Christo? 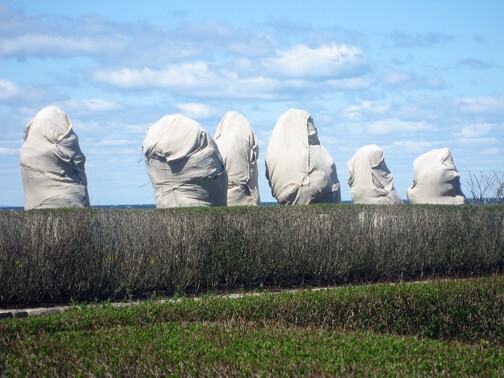 I have one word for this landscaping: creepy.